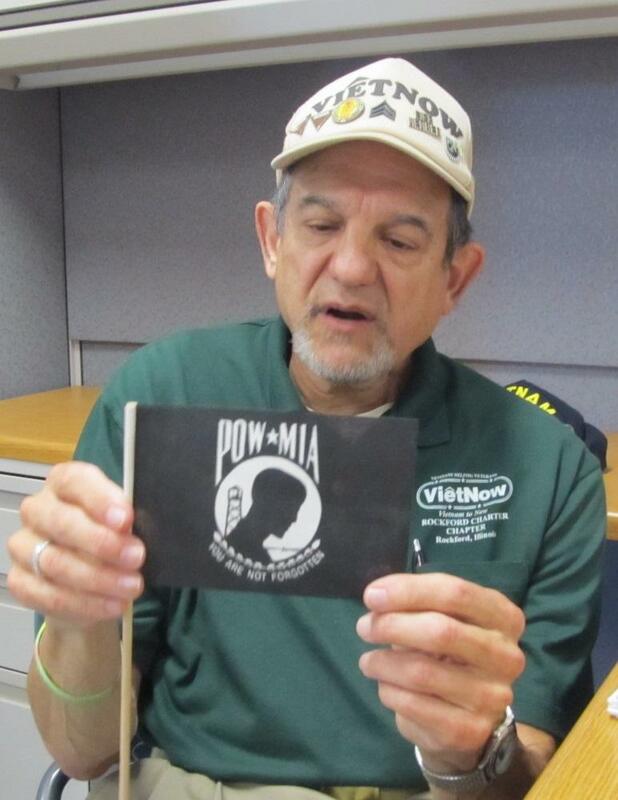 Vietnam2Now's Dr. Michael Belinson displays a miniature POW/MIA flag. Friday, Sept. 21, is National POW/MIA Recognition Day. It was established to honor prisoners of war and those still missing in action. Dr. Michael Belinson is with Vietnam2Now (formerly the Rockford chapter of Vietnow.) He said the group's ceremony at Loves Park City Hall will be one of many across the state, and worldwide. "It's celebrated at the U.S. Capital and state capitals," he said. "It's celebrated on military bases, ships at sea. Any country - other countries- where Americans are buried." Belinson served in a mobile army surgical hospital, or MASH, unit in Vietnam. He said there will be candles for all those from Illinois still missing in action in southeast Asia. He said it's important to keep alive the memory of those who didn't return from war, as well as the plight of their families. "We had a family here in town, the Boyer family," he said, "whose son disappeared in Laos way back in the late '60s. And his mother passed away a five years ago in her mid-nineties - and never saw her son." Belinson says people also are invited to remember loved ones from other wars. He says he will add a couple of candles for friends of his who didn't make it back from Vietnam alive. In the 1990s, Congress officially declared the third Friday in September a day to honor those who were prisoners of war and those still missing in action. That followed years of informal events dating back to 1979, plus ad hoc proclamations by Congress and the President. It's one of six days of the year that the POW/MIA flag can be flown at the White House, Capitol, major military installations, and other federal buildings. The Loves Park ceremony - the 23rd observance for the Rockford area group - will include a keynote speaker, music, video, and a "Missing Man" table, drawing on a tradition among military units to recognize those who served and are unable to be present.